Really, it’s a fun comic. You should read it. So here’s a Superman comic that I bought off the stands way back in 1983. That’s a scan of the actual comic, straight out of my collection, up there. There’s nothing particularly of-note about it, as individual issues go. It’s not a key issue, no first appearances (aside from Superman’s “brother,” whom I believe is never seen again), not particularly scarce by any means. Just your plain ol’ Superman comic, with a dime-a-dozen Gil Kane cover, and yet another art job, the latest in a string of hundreds of assignments on the character, from Curt Swan. Another story by Cary Bates (plot only this time, scripted by Paul Kupperberg). …we thought at the time. What I wouldn’t give to be able to wander into a local newsstand (or even my own store, though that dispels the nostalgia somewhat) and be able to pick up a new Superman comic, with another wonderful Gil Kane cover like the one above, with more beautiful Curt Swan art, written by either Cary Bates or Paul Kupperberg…or, you know, both. Or with Kurt Schaffenberger art. Or with Elliot S! Maggin scripts. Or…well, you get the idea. The Superman comics were always just sort of there, but looking back at them today, knowing that exact style of Superman comic will likely never return…well, they all seem a little more special now. Even the ones where Superman meets a brother he didn’t know he had. No, really. And his brother’s a secret agent! It’s all pretty awesome. EDIT: See the comments for more comic book appearances of Superman’s brother. I enjoyed then and still admire Kane’s 80’s DC work over that of the 70’s, especially his covers. 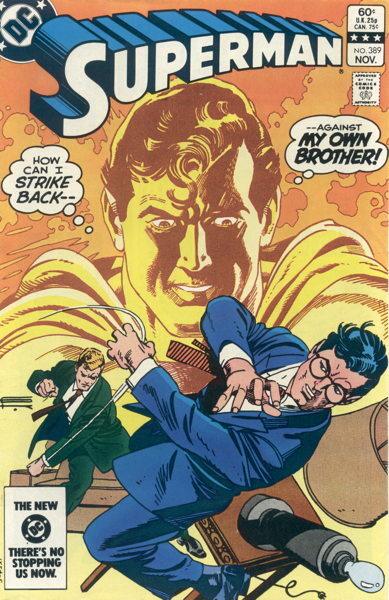 Sword of the Atom was a fun read, and though Swan’s Superman is the one I most think of as “the one true Superman” look, it was actually Kane’s Superman comics that got me to pick it up regularly as opposed to once-a-year (or when DC Comics Presents had a preferred co-star). Yeah, I took those for granted, too, and, no knock on Byrne, but I was disappointed that the Man Of Steel fresh start meant no more Kane or Swan Supes (and bye-bye to Kane’s [I think] new designs for Braniac and Luthor). I can’t check right now, but my memory is that Superman’s “brother” did appear at least one other time. If I get a chance I’ll verify it this weekend. I’m pretty sure he appears in at least a few more Superman stories as well. He appeared at least once more in Superman 369. His name was Cory Renwald. Though harder to come by anymore, my collection is full of Superman comics from this era that I got from quarter bins at conventions. Literal quarter bins. Five for a dollar. I’ve not even read all of them that I’ve bought but I love having them in my collection. We were spoiled. This was one of the first Superman comics I ever read. I remember that cover. Don’t remember the story at all, but something about it must have hooked me if I’m still reading them 33 years later. Looks like he was in SUPERMAN #372 as well. So this comic seems to be his fourth and final appearance. SUPERMAN #389 cover colored by Anthony Tollin, long ago in a galaxy far away! Anthony – And a fine coloring job that was, too! That cover certainly stands out. Is this the first appearance of Jon Carroll? Heck I’d be happy if we could just get some of these late 70s to early-to-mid 80s stories collected. The fact that I can’t get a Carey Bates or Elliot S! Maggin or E. Nelson Bridwell or Paul Kupperberg collection of Superman stories is just sad, and the fact that a Curt Swan collection doesn’t exist might just be criminal. I was happy to be able to pick up the Gil Kane and Jose Luis Garcia-Lopez collections, so that’s nice. But for Batman they’ve put out something like a dozen of those creator collections and for Superman something like two. I’d really love to see more. Jer, I was just in several of my local Half Price Books stores and they had tons of the Gil Kane, Garcia-Lopez, etc. Superman TPBs. I’m guessing DC or the distributor liquidated the whole bunch. Mr. Sterling might be able to tell us more about what that means as far as sales for those titles went. Maybe they didn’t sell well and DC feels there’s not a big enough market. Hmm… must be that new math I keep hearing about. Dandru, I work in marketing. Math is always the first thing to go. But that bonus comic for helping a guy thin out his back-stock always worked on me.